Rooster Teeth has plenty of content coming out in the next few months to excite its fans. 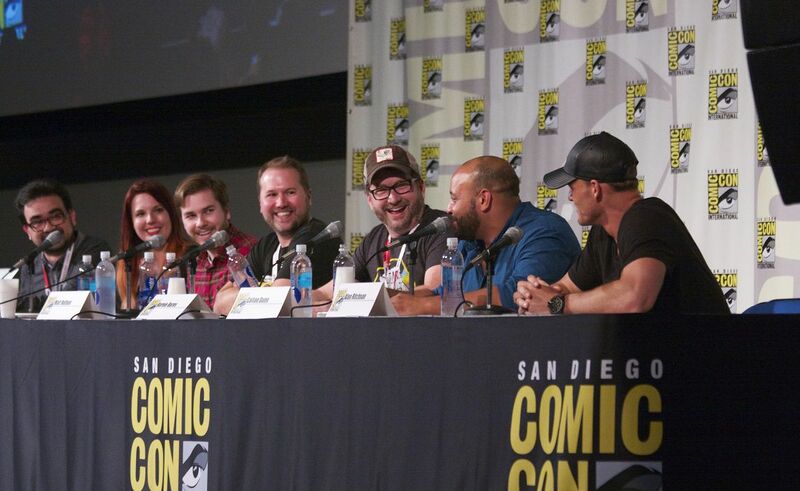 At San Diego Comic-Con on July 11, 2015, the production company unveiled the official X-Ray and Vav season two trailer and discussed its upcoming sci-fi comedy feature film Lazer Team. In the official trailer for season two of X-Ray and Vav, viewers are re-introduced to the titular characters voiced by Ray Narvaez, Jr. and Gavin Free. The animated series, which originally launched in November 2014, is also bringing on board new characters voiced by Adventure Time’s Jessica DiCicco and Parks & Recreation’s Colton Dunn (who’s also starring in Rooster Teeth’s Lazer Team film). X-Ray and Vav season two premieres on July 18, 2015; a total of ten episodes will be released in two batches of five each. Rooster Teeth sponsors get to see the first episodes a day before they’re released to the public on July 19. Rooster Teeth’s Lindsay Jones said at the SDCC panel the company would like to continue X-Ray and Vav beyond season two if fan reception is positive. In addition to the X-Ray and Vav news at SDCC, Rooster Teeth employees revealed some interesting facts about the production of the company’s first feature film Lazer Team. CEO Matt Hullum noted how filming took place over about 30 nights, mostly in sub-zero temperatures. Dunn said some of the cast members “may or may not” have eaten eight burgers each during one scene instead of spitting out their bites after each shoot. Hullum said an official release date for Lazer Team will be revealed in the near future, but he noted that the flick will definitely be available sometime in 2015.